With students back on campus and classes beginning, the nine schools that make up Emory University have big plans for the new semester, from exciting events and programs to ambitious strategic planning. The nine schools that make up Emory University have big plans for the new semester, from programs and conferences to strategic planning and new facilities. Candler is spearheading a three-city tour on the death penalty, featuring noted author and activist Shane Claiborne. “Executing Grace in Georgia: A Faithful Discussion About the Death Penalty” will take place in Glenn Memorial Auditorium on Feb. 3. Two additional events will be held in Athens and Macon on Feb. 4. Amy K. Butler, senior minister at The Riverside Church in New York City, will preach during worship in Cannon Chapel at 11:05 a.m. on March 14. All are welcome. On March 23-24, Candler will host the Bandy Preaching Conference on the theme “Preaching a Relevant Word: Politics, Policy and the People,” with keynote William Barber, chair of the North Carolina NAACP. To meet the ambitious objectives outlined in the College’s current strategic plan draft, interim Dean Michael Elliott has formed three ad hoc committees to define and refine more clearly the pathways needed to achieve the College’s broad goals to provide an exceptional education in the liberal arts, support ambitious research, and recruit and retain exceptional scholars. One committee is assessing administrative infrastructure to identify ways to enhance and streamline current processes. Another will identify the specific support necessary for the College faculty to meet its pedagogical and curricular ambitions. A steering committee is working to revise the current strategic plan itself by developing more specific steps, goals and timetables for implementation, and provide an updated document to the provost by the end of April. Updates and more details can be found on the Strategic Planning page of the College website. The search for the next dean of Emory College continues with interviews and campus visits of potential candidates later this semester. The goal is to announce the next dean before the summer break. A group of faculty from across several Arts and Sciences departments have convened a new Initiative in the Theory and Modeling of Living Systems, which will cultivate further research that builds theoretical frameworks for understanding living systems. 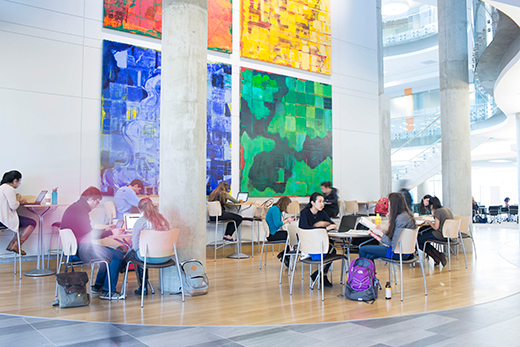 The goal is to connect this community with experimentalists, train the next generation of researchers in the field, and establish Emory as a national leader in theoretical and modeling approaches to living systems. Spearheaded by Ilya Nemenman, professor of Physics and Biology, the highly interdisciplinary initiative involves faculty from across the natural sciences. The first cohort of the Emory College Class of 2021 was selected from a record application pool of students during the university’s first round of early decision. The 1,595 Early Decision 1 applications for Emory College and Oxford College include 610 students who applied to both; 474 applicants were admitted directly to Emory College. These are students who know they want to attend Emory University and are committed to enrolling if admitted. Goizueta Business School began the strategic plan process by identifying several strategic themes with crucial intersections across education and industry. These themes also align with the school’s proven expertise. From there, the school channeled the university’s longstanding mission and its namesake’s lived values. Themes include: Behavioral Insights, Business Analytics, Entrepreneurship, Experiential Learning, Healthcare, Leadership, Real Estate and Private Equity and Social Enterprise. Learn more about the strategic plan. A project aimed at helping business students gain confidence through acting that began at Carnegie Mellon University will take place at Emory this spring. The Executives OnStage module will be held in late February over the course of three days. The module has its roots in the Carnegie Mellon School of Drama and the Tepper School of Business, where Geoffrey Hitch, the module’s lead instructor, is an associate professor of Acting and Business Communications. The module was created after Hitch and Goizueta’s Michael Prietula, professor of information systems and operations management, noticed many students in the Tepper School were “quantitatively excellent,” but did not do well in front of a group. Prietula met with Hitch and the pair began to envision a course on acting for business that would allow students to grow more comfortable with public speaking. After a successful run at Carnegie Mellon over several weeks, the course will be condensed into a shorter series of workshops for Goizueta students. Prietula, the assistant instructor for Executives OnStage, says the three-day module covers the fundamentals of dramatic and stage acting in an intimate class setting with roughly 20 students. “The goal is to help MBA students in their presentation before, during, and after their time at the podium,” Prietula says. The Robson Foundation, named for former dean John E. Robson, has pledged $2.1 million to establish the “John Robson Endowment for the Study of Business, Public Policy and Government” at Goizueta Business School. The gift will lead to the establishment of a program focused on the growing complexities of business and civics. The endowment will drive the efforts of the John Robson Program for the Study of Business, Public Policy, and Government, directed by Jeff Rosensweig, an international business and finance professor. Robson served as dean at the then-Emory Business School from 1986 to 1989, leading the charge to raise the school to national and international prominence. The Laney Graduate School’s Emory Diversifying Graduate Education initiative, or EDGE, launched an open dialogue series in fall 2016 to provide space for Laney students to express their views on current affairs and issues of debate. Forums such as "Beyond the Hashtags" and "Where Do We Go From Here? The Future of Scholarship and Activism" engaged Laney students in timely conversations about America’s social climate and issues facing underrepresented students at Emory. Spring 2017 forums will include topics such as "New America: Navigating the Social Landscape as an Underrepresented Student." Finalized dates will be posted to the Laney Graduate School calendar. The Center for the Integration of Research, Teaching and Learning (CIRTL), of which Emory is a member, has announced spring 2017 opportunities, including MOOCs and cross-network courses. Courses such as "An Introduction to Evidence-Based Undergraduate STEM Teaching," "Teaching as Research," "Basics of Online Learning and Teaching" and more are now open for registration. The Three-Minute Thesis or 3MT is an academic competition developed by the University of Queensland, Australia. The Laney Graduate School 3MT competition serves as a skills development program that challenges students to explain their research project either through verbal communication (in three minutes or less) or by written abstract (350 words or less). Both competitions are judged by a panel comprised of a diverse group of professionals (academic and non-academic) with a wide range of professional expertise. 3MT finals will take place in spring 2017, dates forthcoming. Emory Law welcomes new degree-seeking students from four countries, eight states and 44 undergraduate or graduate institutions to its Juris Doctor (JD), Juris Master (JM), Master of Laws (LLM), Master of Comparative Law (MCL), and Doctor of Juridical Science (SJD) degree programs for Spring 2017. Emory Law is now making its juris master degree for non-lawyers available in an online study format for two of its concentrations: health care law, policy and regulation; and business law and regulation. Registration starts Jan. 16 for fall semester 2017 enrollment. Emory Law has been celebrating its centennial year with a range of events held throughout the school year, and culminating with a centennial and reunion weekend celebration for alumni April 27-30, 2017. As part of the commemoration, the school has assembled "The Emory Law 100," a list that honors notable alumni and faculty for advancing the rule of law, making history at Emory or beyond, and significantly advancing the Emory or Emory Law community. The full celebratory schedule is available here. Margo Bagley 96L has been named Asa Griggs Candler Professor of Law. Senior lecturer Kathleen N. Cleaver is a recipient of the 2016 Freedom Flame Award. The Association of American Law Schools’ (AALS) Section on Women in Legal Education has selected Woodruff Professor Martha Albertson Fineman as the next recipient of the Ruth Bader Ginsburg Lifetime Achievement Award. The Section on East Asian Law and Society for AALS has selected professor Teemu Ruskola’s book "Legal Orientalism: China, the United States, and Modern Law" for its first-ever Distinguished Book Award. Randee J. Waldman, director of Emory Law’s Barton Juvenile Defender Clinic, was recently recognized with the Champion of Justice Award. In November, Chris Larsen stepped down from his positions as dean of Emory’s School of Medicine, director of the Emory Clinic and physician group president of Emory Healthcare. He has returned to his clinical practice and research program with the Emory Transplant Center. Jonathan Lewin, the executive vice president for Emory University Health Affairs, named David Stephens, interim dean for the School of Medicine. Stephens is the Stephen W. Schwarzmann Distinguished Professor of Medicine. Prior to accepting the role of interim dean, he was vice president for research for the Woodruff Health Sciences Center and chair of the Department of Medicine. He joined Emory’s faculty in 1982, and has served in key leadership roles including director of the Department of Medicine’s Division of Infectious Diseases during that time. Ira Horowitz, the School of Medicine’s executive associate dean of faculty affairs and professional development, has been named interim director of the Emory Clinic and physician group president for Emory Healthcare. He will also serve as interim executive associate dean of clinical affairs. Prior to accepting these roles, he was the chair of the Department of Gynecology and Obstetrics. Horowitz joined Emory’s faculty in 1992. He served as the chief medical officer for Emory University Hospital for 10 years. In the fall of 2016, Maria Aaron was named associate dean for graduate medical education. She is the new designated institutional official for GME. Nate Spell was named associate dean for education and professional development for the School of Medicine. He is also responsible for the school’s continuing medical education (CME) programs. Jaffar Khan was named associate dean for Grady education. In this role, he serves as the primary liaison between the SOM and Grady Memorial Hospital student and resident education. The Nell Hodgson Woodruff School of Nursing was recently ranked first among nursing schools for National Institutes of Health (NIH) research funding. The School of Nursing secured $7.8 million in research grants, fellowships, training grants and other awards from NIH in FY 2016, representing the highest NIH funding total in the school's history. The school garnered more than $15 million in external research in FY 2016. Deborah W. Bruner, professor at the School of Nursing, was elected to the National Academy of Medicine, which is one of the highest honors in the fields of health and medicine and recognizes individuals who have demonstrated outstanding professional achievement and commitment to service. Angela Amar, assistant dean for BSN education, was inducted as a fellow of the National League for Nursing’s prestigious Academy of Nursing Education. Sharron Close, assistant professor; Jennifer Foster, clinical assistant professor; Suzanne Staebler, clinical associate professor; Kathryn Wood, associate professor, and Kate Yeager, assistant professor, were inducted as fellows of the American Academy of Nursing, the largest number of Emory faculty ever inducted into the academy in a single year. Kelly L. Wiltse Nicely joins the School of Nursing as the nurse anesthesia program director. Susan Brasher joins the School of Nursing as a clinical assistant professor. Students at the School of Nursing will now gain experience in the birth process outside of the hospital setting through a new academic and clinical partnership with the Atlanta Birth Center. The community-led Atlanta Birth Center is rooted in the midwifery model of care, and is the only freestanding birth center in Atlanta. The School of Nursing also partnered with the Emory Department of Neurology and the Department of Psychiatry to launch the academic health system’s first nurse-led medical home, the Integrated Memory Care Clinic. After almost two years of work, Oxford’s new strategic plan is complete. Following its initial presentation in December, the plan has been endorsed by faculty, staff and administration. This week, it will be presented for approval to the Oxford Board of Counselors and the Student Government Association. Titled “Pathways of Excellence,” the strategic plan focuses on three priority themes: academic excellence, leadership applied to real life, and the value of an Oxford-Emory education. Oxford’s new dining hall, under construction since summer 2015, is complete and set to open. Located on Pierce Street, across from the old facility, the new dining hall features an open interior designed to give greater flexibility in both seating and the way in which food is prepared and presented. Casual seating areas both inside and out are spaces where faculty, staff and students can interact and relax. A private dining area can accommodate 100 diners or 150 seated for a meeting. Oxford has established the Advising Support Center, which will focus on giving a seamless student experience from Oxford through the Atlanta campus. This is part of Oxford’s collaborative efforts with colleagues across Emory at work on President Sterk’s Undergraduate Experience Initiative. Lauren Braun serves the center as assistant director and Emory integration specialist. Oxford's Commencement will be Saturday, May 6, at 10 a.m. on the college quad. The commencement speaker will be Teresa Rivero 85Ox 87B 93MPH, lead senior program officer with the Bill and Melinda Gates Foundation and an Emory University trustee. James V. Lavery has been named the inaugural Hilton Chair in Global Health Ethics at the Hubert Department of Global Health, as well as a faculty fellow of the Emory Center for Ethics. In his new role, Lavery will provide leadership in public health ethics across the university and serve as a resource to Emory's partners in the global health community. Kimberly Maune has been appointed assistant dean for research administration and senior director for research shared services. Myra Oviatt has joined Rollins as director of strategic communications. K.M. Venkat Narayan, Ruth and O.C. Hubert Professor of Global Health, has been elected to the 2016 class of the National Academy of Medicine, formerly the Institute of Medicine. Patrick S. Sullivan, epidemiology professor, was appointed to the Presidential Advisory Council on HIV/AIDS. Council members are a diverse group of 24 researchers, service providers and community leaders from around the country. Rollins is a Grand Challenges Explorations winner, an initiative funded by the Bill & Melinda Gates Foundation. Kristin Wall, assistant professor of epidemiology will pursue an innovative global health and development research project titled "Improving post-partum intrauterine device services in Rwanda." Grand Challenges Explorations supports innovative thinkers worldwide to explore ideas that can break the mold in how we solve persistent global health and development challenges.